Designed for winter mountain sports, the $129.95 Outdoor Tech Chips are compatible with any helmet that features an audio enabled liner. The headset is also compatible with Siri, and features an integrated microphone for dictating commands and making calls. The real selling point of the Chips headphones is the fact that both the left and right earpieces are essentially giant buttons. You cannot miss them when you try to press them, even when you're bundled up in warm ski gloves. 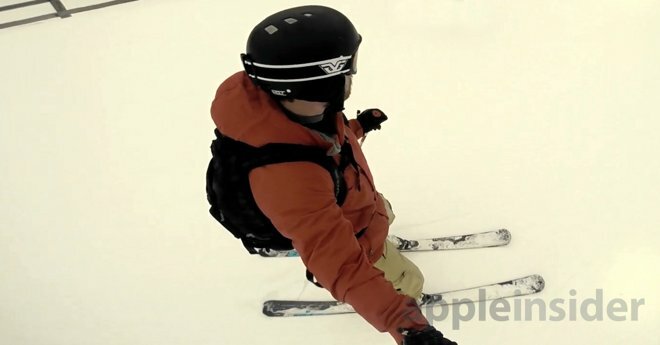 AppleInsider tested the Outdoor Tech Chips on a ski trip to Utah this season, and we came away impressed. 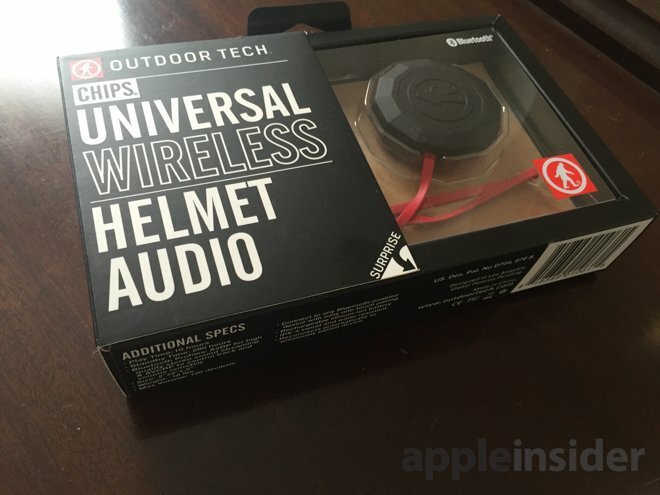 While somewhat pricey, the headphones proved reliable and durable, and gave us an easy way to control our iPhone without needing to take it out of our pocket, or expose our hands to the cold mountain air. 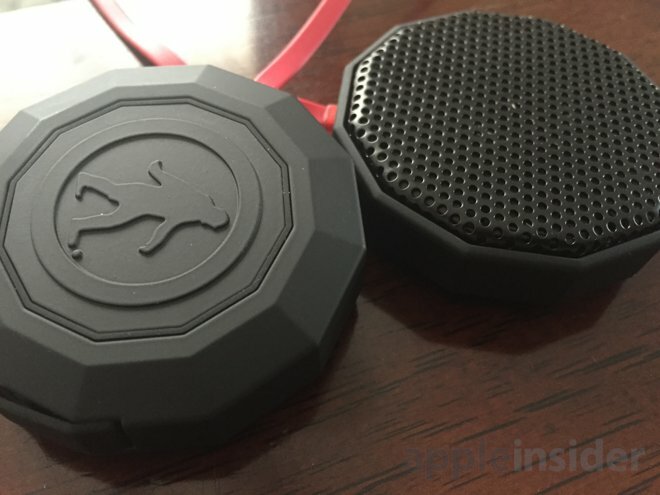 The Chips feature a simple design of two earpieces with a flat cord connecting the two. They fit perfectly fine in our Giro helmet, with plenty of extra cord to provide wiggle room to make sure the earpieces were properly located. 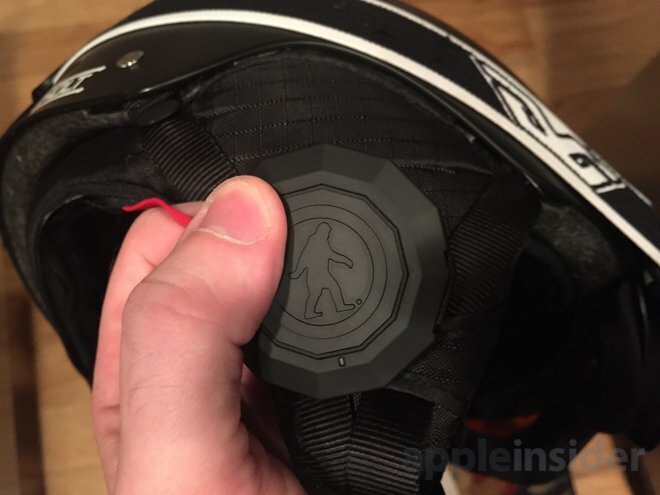 Once dropped in a helmet and placed on your head, the left button controls the volume, and the right earpiece's button can be used to play and pause music, or answer a call and hang up. Provided your helmet has soft earpads with a space for headphones, it's easy to just press on your ear to activate these buttons. The simplicity of two buttons does come with a bit of a learning curve, which is typical for Bluetooth headphones. On the left ear, users must press the button once to raise the volume, while a quick double-press lowers volume. This works well when you want to quickly lower the volume, as multiple presses in a row will reduce the sound. 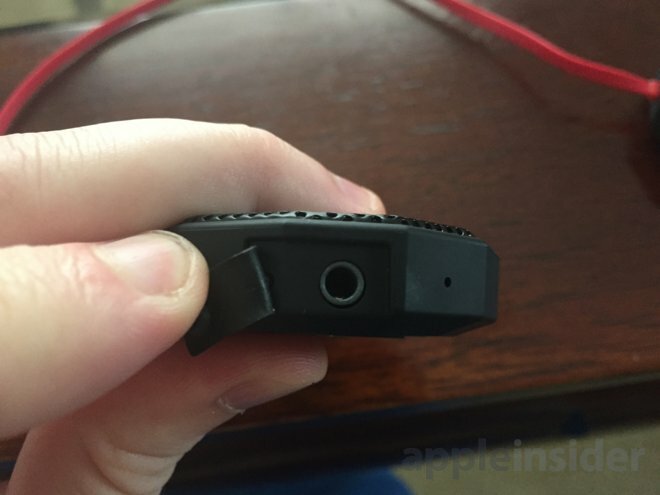 On the right ear, holding down the button turns on the unit. One press will play music, while another will pause. And if a call is incoming, one press answers while another will hang up. Activating Siri requires the use of both buttons —press and hold the left button, then press the right button to invoke Apple's voice driven personal assistant. We'll have more on using the Chips with the iPhone later in the review. In a particularly welcome inclusion, the Chips also feature a headphone jack, so they can also be used wired to an iPhone or otherwise if preferred. In this sense, the Chips offer the best of both worlds for personal audio preferences. 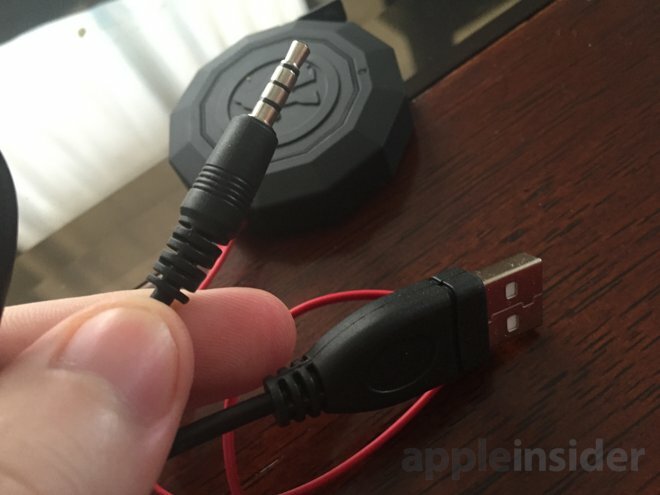 Unfortunately, this 3.5mm headphone jack also serves as the charging port, which means recharging the Chips requires a unique headphone-to-USB cable. While we admire the ingenuity of limiting the device to one input port, we can't help but feel like this is a proprietary cable that some users will inevitably lose. Sticking to a more widely used port like micro USB would have been preferable. As for how it sounds, the Chips are plenty loud to be heard, even when flying down the mountain. We would caution users to use caution and listen to music at a reasonable level, as being aware of your surroundings on the mountain is important for everyone's safety. The headphones are rated at a max volume of 112 decibels through its 40-millimeter drivers, and boast a play time of 9 to 10 hours. Standby time is advertised at 280 hours. We never had the battery die in our tests, in which we spent up to 8 hours on the mountain, with music played and calls made sporadically throughout the day. Also worth noting is the Chips are rated to work "perfectly" at -4 degrees Fahrenheit. Last year, we attempted to use the Oakley Airwave 1.5 heads-up display with Apple's iPhone, but bitterly cold temperatures in the Canadian Rockies rendered the technology inoperable. The temperatures we experienced this year weren't nearly as cold, but we didn't have any issues with operation. Pairing the Chips with an iPhone is easy—ï¿½simply hold the power button to turn on and put into pairing mode, then connect with the iPhone. We had no problems establishing or maintaining a connection between the headset and our iPhone, whether the phone was held in a pocket or in a backpack. It takes some time to get used to the button presses used to control the Chips, but once you're accustomed to the controls, it's easy to use. Siri integration is particularly welcome, allowing you to easily respond to text messages, place phone calls, or listen to an artist without the need to take off your gloves. That also means your iPhone can stay in your pocket, or backpack. Or in the case of an Apple Watch, you could still use Siri to place a call or dictate a message without needing to touch the screen or manipulate the tiny Digital Crown button. Siri's voice recognition through the Chips headset fails, however, in the wind. That means if you're up on a lift and there's a slight breeze, Siri won't be able to pick up what you say. The microphone integrated into the Chips headset works fine in other situations without wind or too much background noise, but even a mild breeze left Siri confused as to what we were trying to say. Still, for basic music controls and answering calls, the headphones work great. We found it very easy to pause music before we got onto the lift, and restart it at the top of the mountain, for example. Things really get interesting when the iPhone and Chips are used in tandem with a smartwatch like the Pebble or even Apple's forthcoming Apple Watch. This allows incoming calls or texts to be easily viewed on the wrist, enabling the user to then rely on the Bluetooth Chips headset to respond accordingly. In our tests, we used the Chips headset with a not-quite-smartwatch, the Fitbit Surge, and found it to be a great pairing. We imagine things would be even better with an Apple Watch on the mountain. Large, oversized, can't-miss-'em buttons on each ear make this product a winner right off the bat. Support for Siri and calls are even better. We're also glad that it includes a wired option, though the 3.5mm charging cable seems like it's destined to be lost. And Siri did fail us a few times due to the wind and background noise, but this was hardly a major issue. 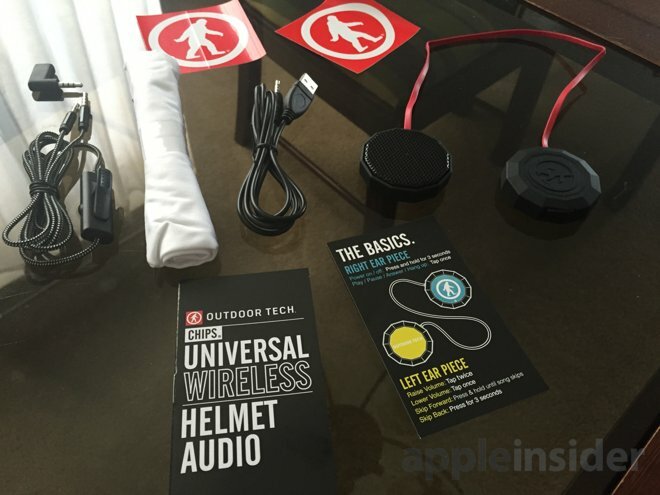 The simplicity and universal compatibility of the Outdoor Tech Chips make them an easy recommendation for anyone on the market for a set of Bluetooth headphones for skiing or snowboarding. The Outdoor Tech Chips can be purchased from Amazon for $129.95.